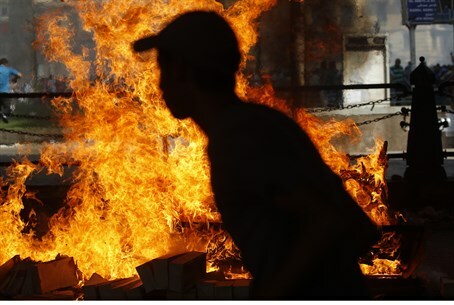 29 dead in Egypt as clashes break out during rival rallies on the anniversary of the 2011 revolt. The death toll in a bloody day in Egypt has risen to 29, AFP reported on Saturday night. Clashes broke out throughout the country during rival rallies on the anniversary of the 2011 revolt that toppled Hosni Mubarak, underscoring the country's violent polarization. Three years after Egyptians rose up to demand the overthrow of Mubarak, thousands of demonstrators in Cairo's Tahrir Square chanted slogans backing another military man, General Abdel Fattah al-Sisi, as police clashed with Islamists and activists elsewhere. The 29 people were killed in fighting across Egypt when police and supporters of the military-installed government clashed with Islamist backers of president Mohammed Morsi, who was deposed in July, according to AFP. Hours before Saturday's rallies, a small bomb outside a police training center in north Cairo wounded one person, while another 16 were wounded when a car bomb exploded beside a police base in the canal city of Suez, the health ministry told AFP. Ansar Bayt al-Maqdis, an Al-Qaeda-inspired group, claimed Friday's bombings, all of which targeted police, and urged Egyptian "Muslims" to stay away from police buildings. Security forces across Cairo moved quickly to disperse scattered pro-Morsi protests while welcoming demonstrators to sanctioned commemorations. In the Muhandiseen district, police fired tear gas and birdshot at anti-government protesters outside a mosque, scattering them into side streets. Gunfire could be heard late into the night in the Alf Maskan neighborhood, where some of Saturday's deadliest fighting took place, a witness told the news agency. Of the 29 people killed, 26 died in Cairo and its suburbs, health ministry spokesman Ahmed Kamel told the news agency. Another 168 people were wounded, and police said 725 suspected protesters were arrested. One of the dead in Cairo was a member of the April 6 movement which spearheaded the uprising against Mubarak and had also opposed Morsi, a member of the group told AFP.